I have been a follower of Margaret Dyers blog for a while now, and particularly enjoyed her postings on the workshop she held in France this summer and on impulse one Saturday night I decided to order her DVD The Figure In Pastels. Its not very long, about 27 minutes but at this stage in my development served as a very useful reminder of many of the things I know but often forget and also gave me a different approach in a couple of areas - more of which later. So all in all I am very pleased with it and these first two pastel sketches are a what I knocked out on some recycled Pastelmat the day I received it. I'm looking forward to doing something from life using Margarets method later in the month. 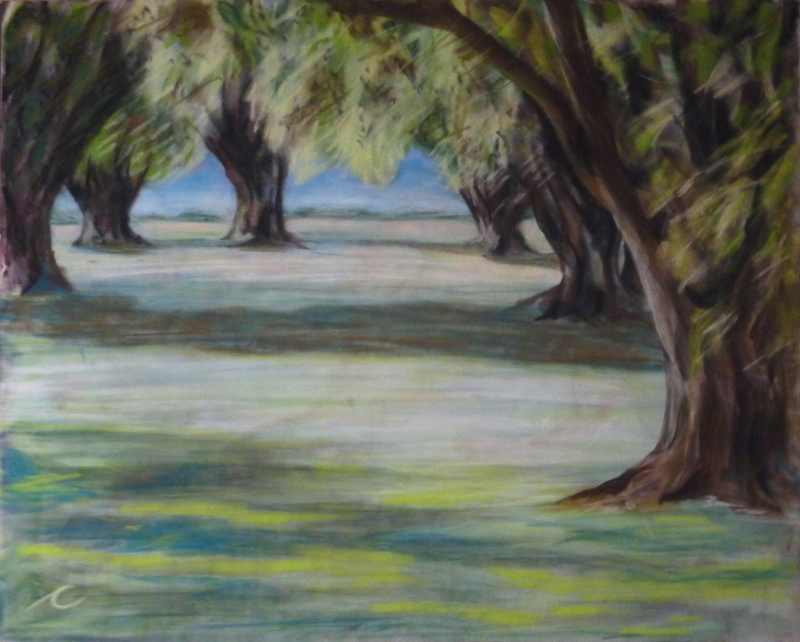 This one is something thats been in my head for a while, its from a photo I tokk in the US of some enormous and impressive trees on a golf course. Great work, namely in terms of values and drawing. The foreshortened perspective on the first painting is really good. Jose, I have just discovered that there is no response to your comment here, I definately remember responding but the cyber-elves must have been naughty. So, if its not too late, thank you very much for stopping by and sharing your views. I cant take total credit for the foreshortening,it was an excellent reference photo and easy to work from but maybe I should get round to revisiting it and do the whole figure.